New London is a seaport city and a port of entry on the northeast coast of the United States. Start off your visit on the 9th (Sat): enjoy the sea views from Cross Sound Ferry Lighthouse Cruises and then try your luck at Foxwoods Resort Casino. On the 10th (Sun), you'll have a packed day of sightseeing: go for a walk through Main Street Park, Essex Village, explore and take pictures at Field House Farm, then see the interesting displays at Allegra Farm And The Horsedrawn Carriage And Sleigh Museum Of New England, then explore and take pictures at Ray of Light Farm, and finally take an in-depth tour of Tantaquidgeon Museum. For other places to visit, where to stay, reviews, and tourist information, read our New London road trip planning website . Newark to New London is an approximately 2.5-hour car ride. When traveling from Newark in March, plan for a bit cooler days and about the same nights in New London: temperatures range from 44°F by day to 29°F at night. Finish your sightseeing early on the 10th (Sun) to allow enough time to travel to Miami. Explore the numerous day-trip ideas around Miami: Fort Lauderdale Beach (in Fort Lauderdale) and Shark Valley (in Everglades National Park). 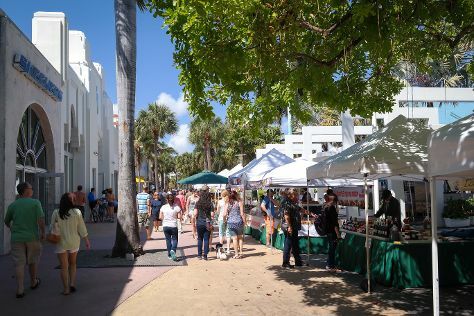 There's much more to do: get to know the fascinating history of Lincoln Road, admire the natural beauty at Fairchild Tropical Botanic Garden, get a taste of the local shopping with Bayside Marketplace, and don't miss a visit to Ocean Drive. For maps, other places to visit, reviews, and more tourist information, use the Miami visit planner. Use the Route module to find suitable travel options from New London to Miami. In March, Miami is much warmer than New London - with highs of 81°F and lows of 65°F. Finish your sightseeing early on the 14th (Thu) so you can travel back home.